These are our standard wireless transmitters that connect to any of our backup cameras. We have been perfecting this transmitter for over 10 years. It is tried and tested to give you a generous 70ft range. This item comes in a set that includes a transmitter and receiver that can broadcast continuously while you’re driving down the road not just when backing up. For those worried about interference from appliances including microwaves, do not worry, when engineering these transmitters we specifically addressed all appliances and made sure you won’t have any interference. With a 95ft range, this set of transmitters will replace our standard transmitters and give you an extra boost for people pulling a vehicle and want some extra range to our standard wireless transmitters. These transmitters are 100% weatherproof and will deliver a great consistent picture every time you need it. 125 Ft range entry level digital wireless transmitters, this set is the same size as our long-range transmitter, but packs a bigger punch, because it is digital. The transmitter locks into the receiver to create a stable signal that can’t be broken no matter how many wireless systems are around you. Much like a Bluetooth headset on your mobile phone, this is guaranteed to deliver a fast activation every time. 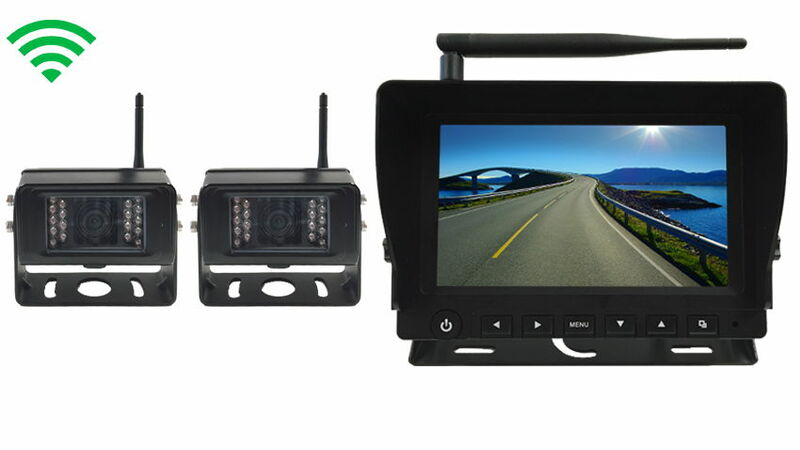 This digital transmitter can be activated every time you go in reverse or can work consistently while driving down the road as for observation camera. Please note for those using our digital products for surveillance or just leave it on while you’re driving, all our digital product are also encrypted and give you an extra level of security that guarantees only you can see your cameras. This is our top of the line digital wireless product. It has a minimum range of 225ft flawless transmission, in our own test and from customer reviews we have seen these transmitters broadcast up to 1000ft. The transmitter is built into a commercial grade extreme weather case and has an IP69 rating to make it 100% water and weatherproof. Though these transmitters are little more expensive we did not name them “Hulk” by accident they truly are the best digital option on the market. “Built-In” means that the digital transmitters and receivers are built directly into the camera (transmitter) and monitor (receiver). There are fewer pieces to install which makes installation easier and provides a cleaner look when everything is complete. The only thing that you need to do is tap into 12V and that is it! Easy Plug and Play Installation. The digital range on the built-in systems has a minimum range of 150ft with some systems with such as the SKU90121 with a range of over 200ft. Purchase tip: most of our systems can be upgraded to long range, digital, or built in. use the options at the top right of the system you are looking at. Also, feel free to give us a call and we’ll help customize your system to include everything you want. I have your standard RV system. I use it on a 42ft RV. While driving down the road the image is not functional all the time. Is there a product that I can purchase to upgrade just the camera for the rear camera. There are several variables that can cause this. I would start by making sure the system is getting a full 12v of power. If your vehicle has a diesel engine you may need an engine noise suppressor but please call us at (866) 966-5550 option 2 for customer service for troubleshooting.